As you could read in the previous report from yesterday, Glenda dropped me off at the train station in Montreal. Before I boarded the train to Toronto we had a sandwich and a drink at the coffee shop. 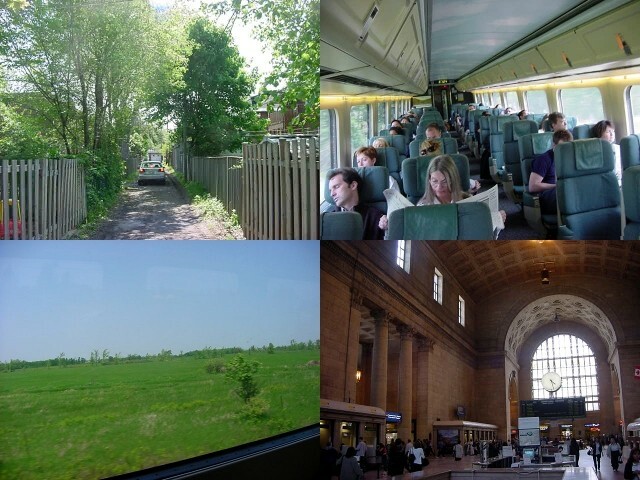 The train to Toronto was packed and during the five hour train ride I enjoyed the green grassy farmland, the forests, the cotton plants and the grain towers. The train had a few stops at places named Brockville, Kingston and Cobourg. I do have invitations along this same route; people who have invited me over. But I guess I unfortunately have to skip this area. It's because I am running out of time. If I take three weeks for this province Ontario, one week each for the three Prairie Provinces, I'll be right on time in Vancouver for my flight home in end of July. The one million square miles (!) of Ontario, Canada's second-largest province, stretch all the way from the St Lawrence River and the Great Lakes to the frozen shores of the Hudson Bay. Some two-thirds of this territory � all of the north and most of the centre � is occupied by the forests and rocky outcrops of the Canadian Shield, whose ancient rocks were brought to the surface by the glaciers that gouged the continent during the last ice age. The glaciers produced a flattened landscape studded with thousands of lakes and it was the local Iroquois natives who first coined the name Ontario, which literary means "glittering waters". From 1820 on the wave of migrants started and they made up Upper Canada, as Ontario was known until the Confederation. With more than four million inhabitants, Toronto is Canada's biggest city, a financial and industrial hub that boasts a hatful of sights: great restaurant scene, a vibrant nightlife, sprawling suburbs and unfortunately the usual ugly industrial townships. The city is 350km southwest of Ottawa, 500km southwest of Montr�al, 560km west of New York City (USA) and 335km northeast of Detroit (Michigan, USA). For decades, Toronto was saddled with unflattering sobriquets � "Toronto the Good", "Hog town" � that reflected a perhaps deserved reputation for unworried poorness and greed. Spurred into years of image-building, the city's post-war administrations have lavished millions of dollars on glitzy architecture, slick museums, an excellent public transport system, and the reclamation and development of the lakefront. As a result, Toronto has become one of North America's most likeable cities. Until this year when the Severe Acute Respiratory Syndrome known as SARS entered this country from Asia, right here in Toronto. The World Health Organisation put Toronto on the list of places "travellers should consider postponing all but essential travel to this area". Ouch. Of course that immediately hurt Toronto. It's industry, economy and tourism. And because not much of that virus was known, the media (as usual) freaked out and for weeks on end (even the Toronto Star newspaper) only published front page news containing SARS news. CNN even showed a report about Toronto, misguiding its viewers (when not!?) with footage of people wearing face masks. CNN didn't tell you that that footage was from China. Life seems to go on in this city of 4 million people. A few hundred people ran to the hospital, paranoid of a cough and lots of them became possible SARS-cases. An outbreak was about to happen! So far, twenty people have died of SARS. And SARS is not a disease that makes your skin cook, before you implode and end up as green jelly on the pavement. SARS is a very severe pneumonia. If you are living unhealthy or if you are old, your body's resistance won't be able to heal from this virus and might cause you to die. I love to prove that life still goes on in Toronto, nobody wears those surgical masks and nobody behaves extremely fearful. Not even on the train to Toronto. I am more expected to die here from the cold (flu) or a traffic accident, than of SARS. But unfortunately there are not many people around who can understand the situation as it just is (right here, right now), and not how it's falsely portrayed in mass media. That's called relativity. I arrived in Toronto at 4.30 in the afternoon and at the terminal I was picked up by Shawn Stackhouse. He had invited me not such a long time ago, but has been following my travels since the start in May 2001. Shawn is an actuary at a big firm in one of these city centre's sky scrapers around the corner from the train station. As an actuary he evaluates the likelihood of future events, designs creative ways to reduce the likelihood of undesirable events, decreases the impact of undesirable events that do occur. I had never heard of that job before! I dropped my stuff in his office room in the complex of one of these sky scrapers. With a walk around the building I had some interesting views on the city from here. From his office building we walked down the streets of downtown to meet his girlfriend Keri, who "is in banking" and works in a sky scraper a few blocks ahead. I was really amazed to walk around here. My mouth fell open of all these huge buildings around me. And it was busy (it was just past 5 pm so everybody was heading home) and I couldn't remember when it was when I last saw so many people in the streets. It certainly wasn't in the Maritime Provinces. Shawn lives in the area of the city named High Park, a handful of stations down the subway line. Keri lives right west of the centre of town, in an area known as the Theatre Block (all on walking distance from that centre). If you take a closer look at the map of Toronto, you'll see that every area has its distinctive name. A few blocks from the Theatre Block is the Entertainment District, followed by Chinatown, the Kensington Market area, Little Italy, Little Portugal, and in the middle of the city is the huge campus of the University of Toronto. Yonge Street starts at the waterfront and makes a straight line through the city, up north. With its length of just over 1900 km Yonge Street is the longest road in the world. Side streets east of Yonge Street are named with East and on the other side these equal named streets have West in them. After a quick stop at Keri's apartment we walked down King Street West, passing the Toronto Dominion Centre, the Goethe Institute, the Roy Thompson Hall and walked along the small but considerate Canadian Hall of Fame. From King Street we got to the parallel Queen Street West, which is located in the Entertainment District. The sun was shining and the sky was blue. People were drinking on terraces, young men were playing guitar on the street and the hot dog carts were doing good business. Shawn and Keri felt like having Korean food for dinner, which sounded great to me as I can't remember having had Korean anything before. We ended up at this cosy small grill room on Queen Street where we experienced cooking our meat in a hole in the table near the window. Not many people know about the Korean cuisine and lots of people were amazed by this grill in the middle of our table, so we were attracting all kinds of people on the street who were staring at our table through the window. That was kind of weird if you are not used to it, I guess. After this delicious meal we walked back down Queen Street West again. It was Monday and mostly on this day Shawn and Kerri love to see the comedy night at their favourite place Rivoli. But because of some special event there was no comedy night tonight. Shawn was very disappointed about that and would love to take me to these famous Canadian comedians. But when we passed Rivoli we were approached by a man from the radio station named The Edge and they had given away free tickets for tonight's concert in Rivoli, but had some spare tickets left. If we had any interest... Tonight there was a album release party of Sam Roberts and his band. The name didn't say anything to me, but Shawn and Keri were suddenly happy again. "Sam Roberts is good! He is slowly becoming this big rock star." Of course we wanted to go to this gig, especially when it is for free, haha! Around 10 o'clock we got in there and the band immediately started. Rivoli is a bar with a concert hall in the back of about 10 metres wide and 50 metres deep, so it's not that big. And it was not that packed either. Everybody could easily move around. Shawn bought us all some local beers and we enjoyed the concert. I was stunned! I was bewildered and at numerous occasions my mouth fell open. Sam Roberts and his band were fantastic! I am not that much of a rock fan, but when I can actually understand what the fuss is about, I enjoy it very much. Sam Roberts played rock music that can be classified as a mix of Coldplay and Good Charlotte, mixed with elements of Led Zeppelin and Jimi Hendrix. And oh my God did this concert rock! And when the option of this concert came up this evening, I thought it would be concert of a few people in a band who made another unnecessary album with their favourite covers, who were playing at their favourite pub, and who wouldn't know how to play Jefferson Airplane if it was requested. Ooh, I was terrible wrong. What a great introduction this day was to Toronto! After the thrilling concert we dropped of Kerri at her apartment complex and after midnight we picked up my gear that I dropped earlier at Shawn's office. We then took the underground metro to get to High Park, where very soon Shawn unfolded the couch into a bed and I had a good night sleep!